One of the first companies I contacted when I began to write my book, Simply American, Putting Our Extended American Family Back to Work, was Wigwam Mills. Wigwam is the premier manufacturer of socks in the U.S.; their plant in Sheboygan, Wisconsin produces an amazing variety of great socks as well as other woolen goods. When I called Wigwam, I was introduced to Gerald Vogel, Wigwam’s President and COO. Mr. Vogel was very supportive of the book and has been very generous with his time and support for both my book and this blog. I have written about Wigwam on several occasions. 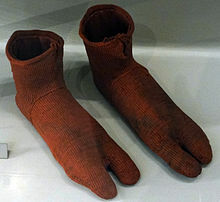 According to Wikipedia, socks have gone through a lot of changes over the years. Early models were made from animal skins and matted animal hair. I think I would have taken a pass on animal hair socks. In the olden days, only the nobility wore socks. After the 1500s, socks began sporting an ornamental pattern called a clock. By 1800, knitting machines were making the overwhelming majority of socks, except for those strange misshapen pairs that we all got when our aunts decided to take up knitting. The last time I spoke with Mr. Vogel, I told him I wanted to do a giveaway with Wigwam socks. Mr. Vogel thought it was a great idea, so last Friday a box with 24 pairs of Wigwam socks arrived on my doorstep. And now you have a chance to win two pair of Wigwam socks by entering my first ever giveway. In order to be entered in the Wigwam Simply American giveaway, you have to do a few things. First, you have to leave a comment to this post in which you tell me about a product made by members of our extended American family, other than Wigwam socks, that you can’t do without. Second, you have to email three friends who you think might find my blog interesting and encourage them to pay me a visit. I will know if you have met the first criteria, but you are on the honor system for the second! With your Wigwam Giveaway entry, please include your name, address, and if you are a woman, your sock size (M = women’s shoe size 6-10, L = 10-13), and whether you want a plain sock or a sock with a design. Guys get large and plain only! I will attempt to honor the ladies size and design requests while supplies last. So the Wigwam Giveaway is officially opened! Get your entries in and if you don’t win a pair of Wigwam socks, do the next best thing. Go out and buy some Wigwam socks at your nearest Wigwam sock supplier. You will get a great pair of socks and you will be supporting members of your extended American family working hard in Sheboygan! This entry was posted in american made, Apparel, Made in America, made in usa, socks and tagged give away, Giveaway, giveway, Made in America, made in america products, Made in the USA, Sheboygan Wisconsin, Socks and Hosiery, Wigwam Mills. Bookmark the permalink. My shoe size is a womans large! My family very much likes our Fiesta Ware dishes. The colors really brighten our day. We have been using them for a year now and not one of them has a chip on them. I especially love the fact that I know that there is not a lead problem with them, unlike dishes from China!